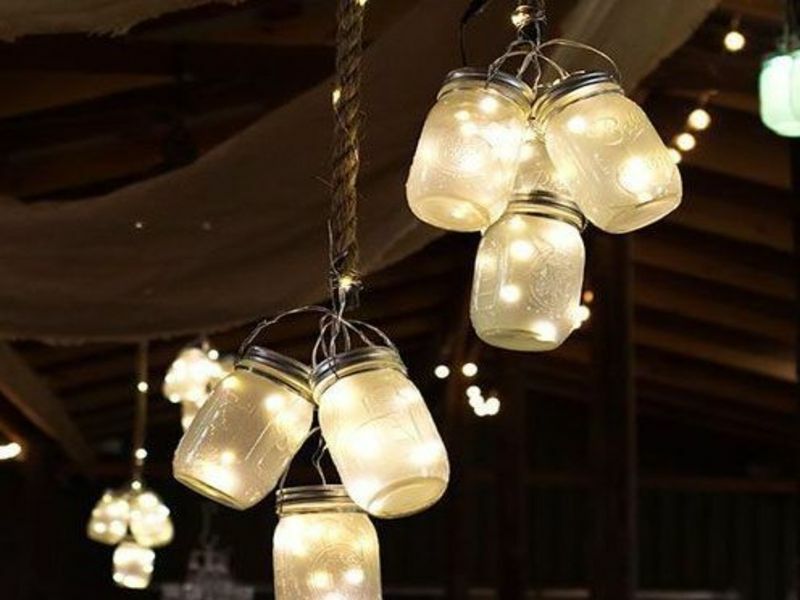 Do-it-yourself mason jar lights have been all the rage on crafting websites such as Pinterest and Etsy for the past few months. 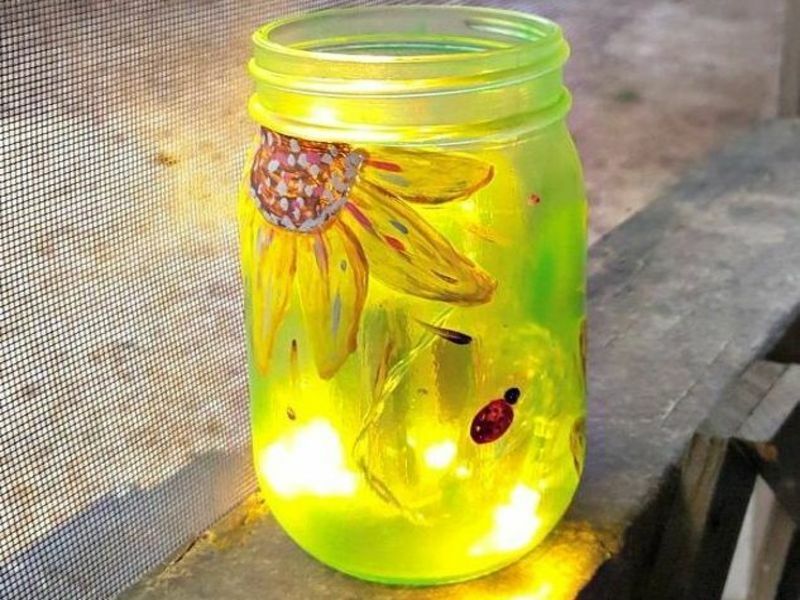 Creating your own mason jar light for your backyard or front porch can be a fun way to bond with your family and get your creativity flowing, so it’s no wonder that they are so popular among crafters. There are hundreds of different ways to create mason jar lights, so to help you narrow down what kind of mason jar light fixture you want to create, here are a few ideas. This mason jar light design gives us the impression of elegance, as it is a classic design. The large mason jars are attached to metal chains and full of small white stones. Each mason jar has one candle inside of it, and when the candle is burning, the light that the jar gives off is calming and dim. This idea comes complete with an element of rustic charm. The jars are anchored on to sleek wooden boards and suspended by metal hooks. The lighting element of the jar is white fairy lights, and the outside of the jars are decorated with straw bows. This design is unique because once it’s completed it is turned upside down. 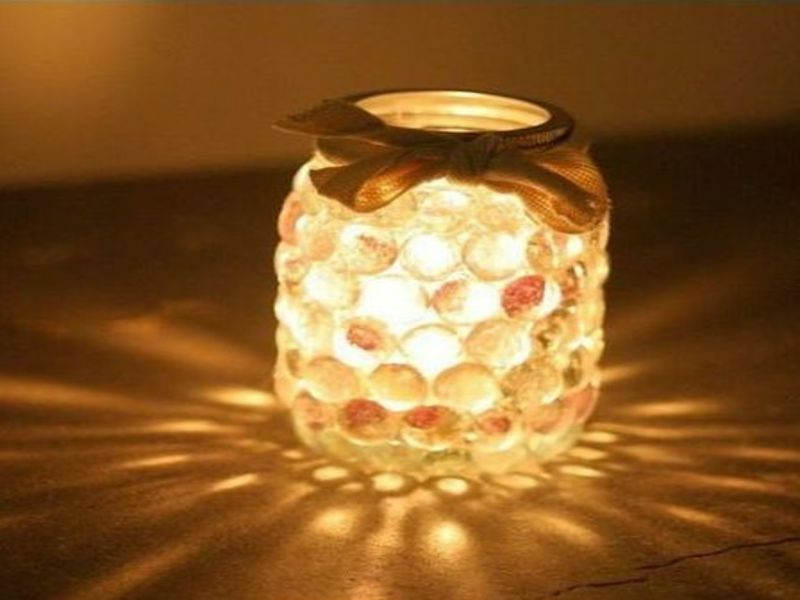 It consists of a flameless tealight that has been glued to the lid of the jar. When the tea lights are turned on they shine through the glass and give off a soft glow. The forest the design on our list has a beach theme. It is a solar powered mason jar light that is full of beach and sea related objects such as shells, dried coral, and sand. The light of this design comes from the solar panel on the lid of the mason jar. This design is interesting because of how it is done. The creator of the design took time to wrap the mason jars in string, and then paint the rest of the jars. Once the string is removed, some of the jar is left bare so that a candle can shine through in those areas. This idea looks time consuming, but is easy and looks great. These mason jar lights are simple yet pleasant to look at. 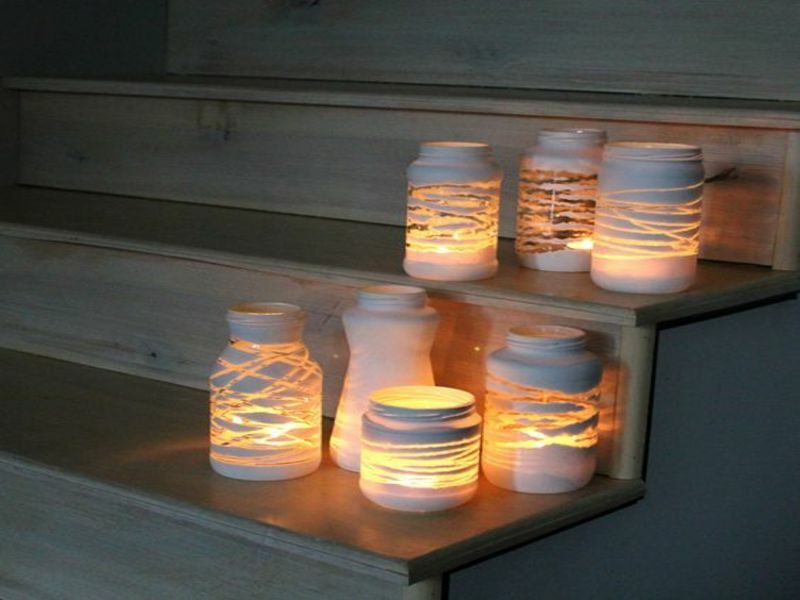 They are just basic candles inside of mason jars, but each mason jar has been built into a long wooden board that connects all of the jars. This design would work well as a DIY light fixture for an outdoor wedding ceremony or dinner party. 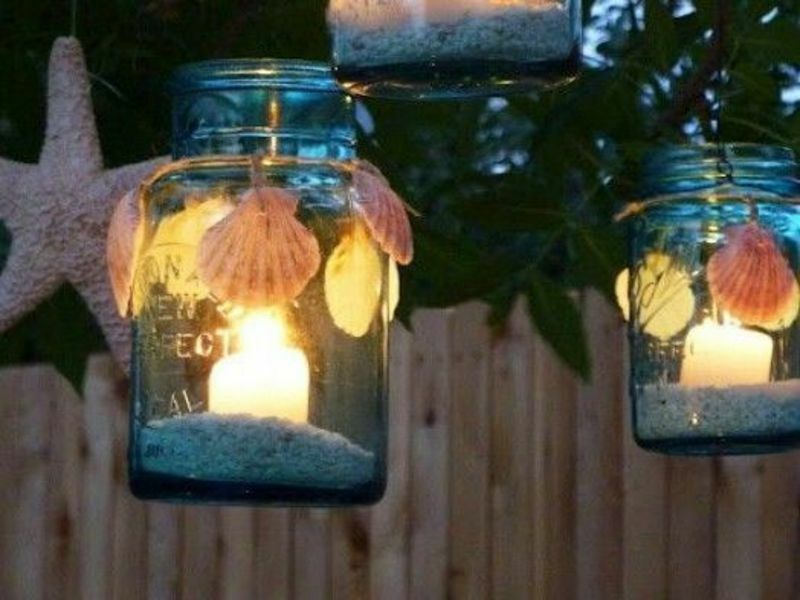 The designer of this mason jar idea must have been thinking about fairies, because that’s exactly what we think about when we see these lights. 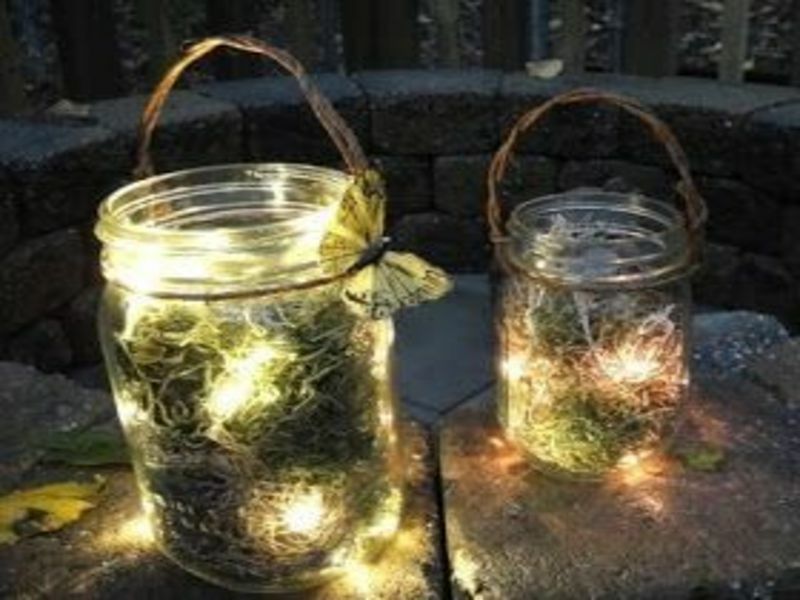 They give off a magical vibe thanks to the moss on the inside of the jars and the fairy lights that are hidden within it. The design is completed with an elegant butterfly decoration on the outside of the jar. 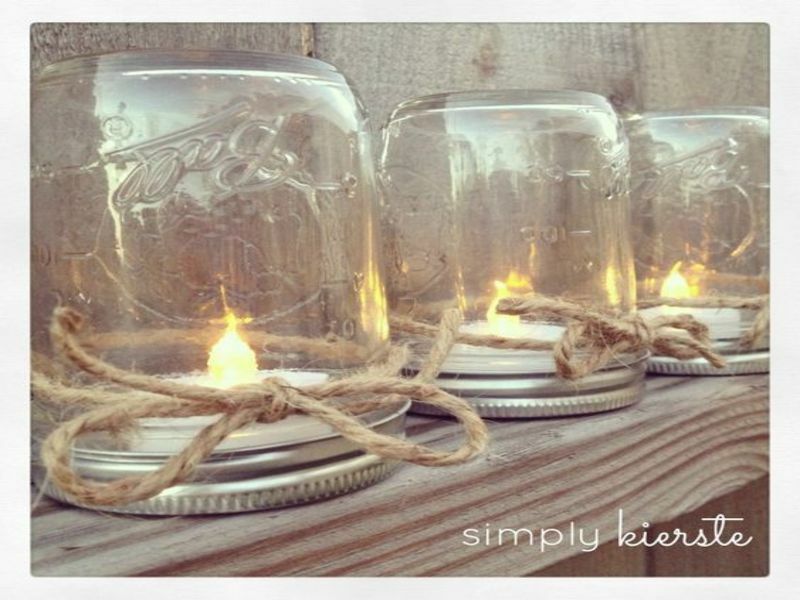 The second beach themed idea on our list, these mason jars are stunning. Each one is full of white sand and topped with a candle. 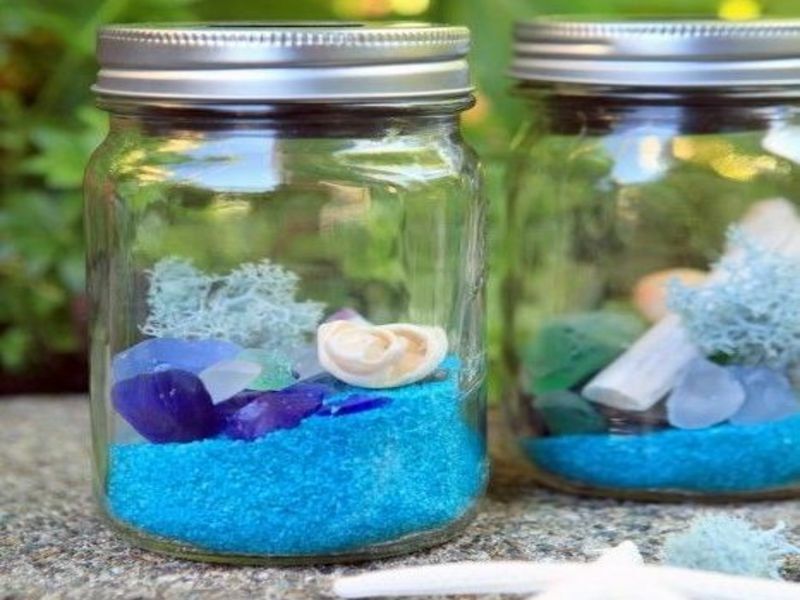 The outside of each of the jars is decorated with natural shells from the beach that have been strung onto string and wrapped around the neck of the jar. 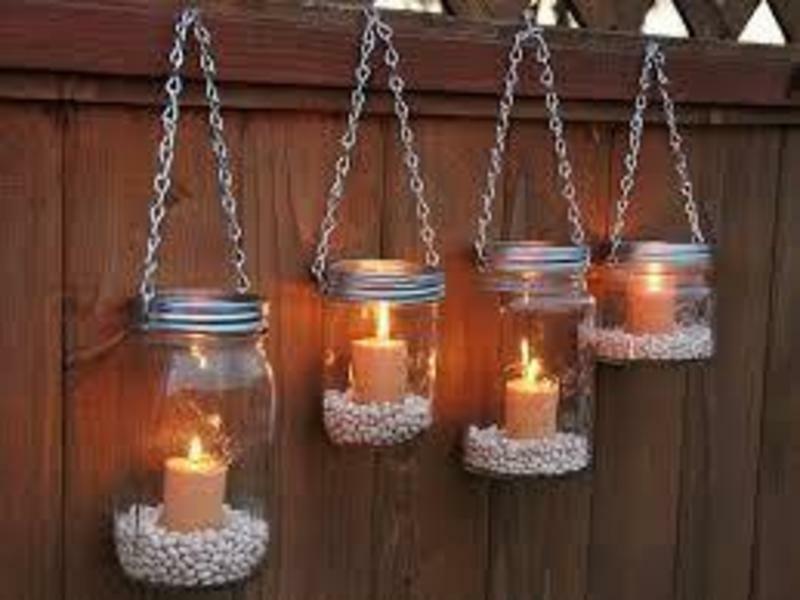 These mason jar lanterns are held together on a wire rack that can be hung outside to give your yard a touch of decoration. Each light is composed of blue Christmas tree or fairy lights, and is left open at the top. When put in a group, they create a serene place for your eyes to rest. A great project for kids and parents alike, this mason jar light is a fun project for the whole family. 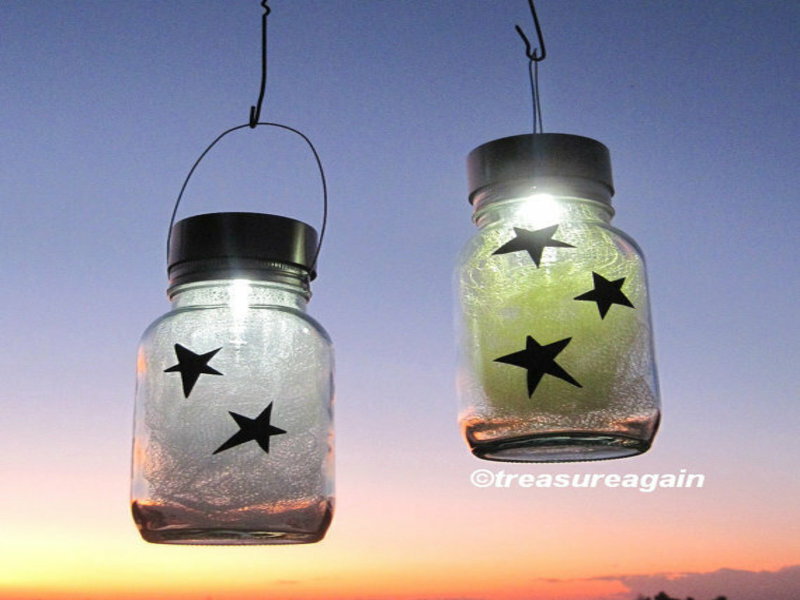 In this design, the mason jar has been painted by hand, allowed to dry, and finished off with fairy lights inside. The candle’s light shines through the paint and gives off an ambient glow. This idea stands out from the rest because it doesn’t require candles or any type of electric lights. This idea relies on the insides of glow sticks. 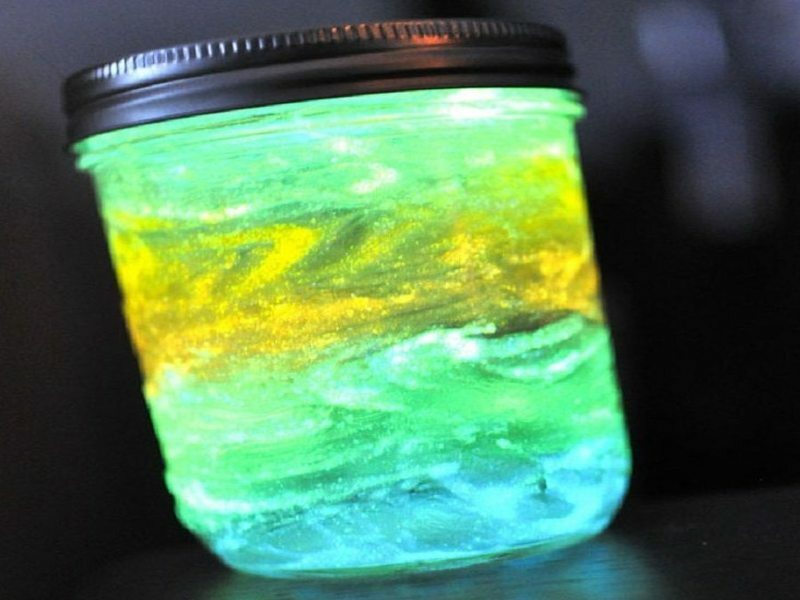 The glow sticks are broken open and the insides are splattered on the inside of the mason jar to create a glow-in-the-dark splatter effect. The twine wrapped around these mason jar light finishes off the look, but the mason jars themselves are the center of attention. Each jar holds a simple tea light to give off an air of simplicity and classic style. They look especially good when they are hung close together. These groups of hanging lanterns are perfect for outdoor events. 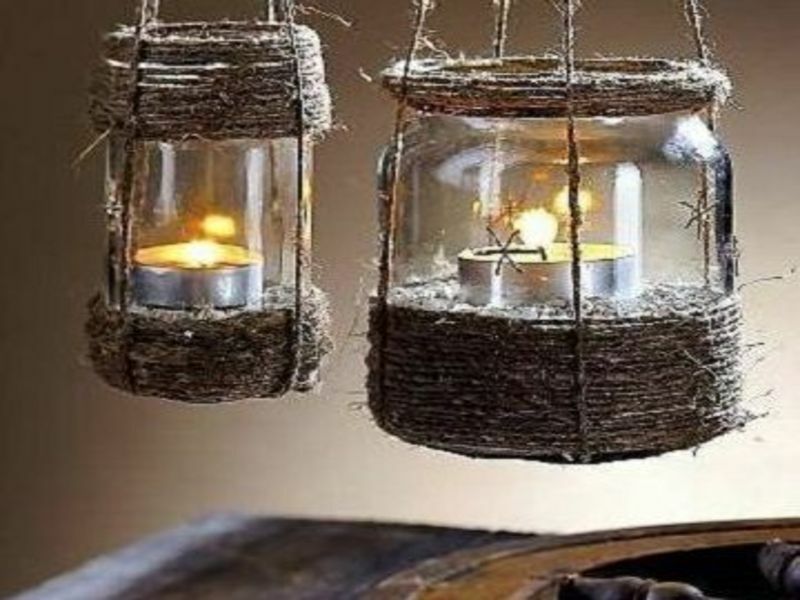 Their made from basic mason jars that have been filled with fairy lights, and then attached to a thick rope in groups of three. Alone, a group of these look beautiful but when they are hung together, they’re truly mesmerizing to look at. This design is perfect for Valentine’s day. It is romantic, spunky, and fun to create. 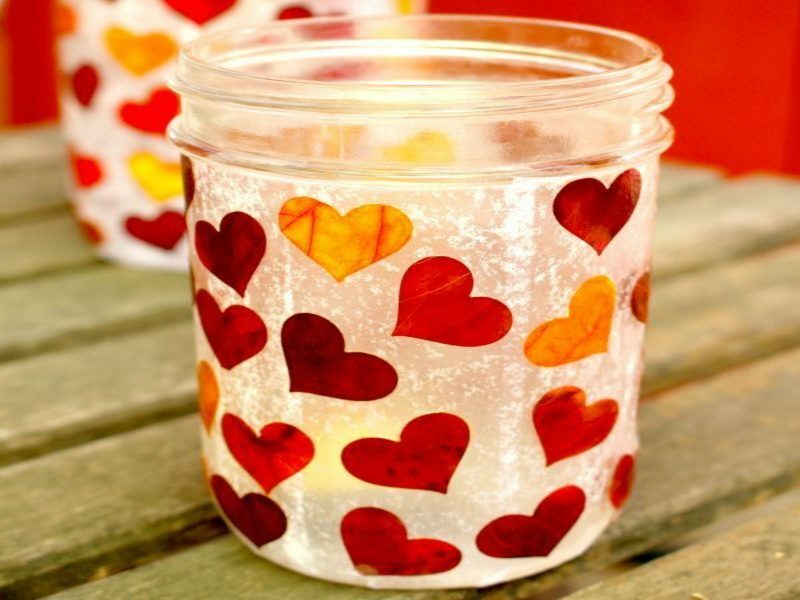 The creator of the design was thinking outside of the box when they made this, and was able to successfully capture the essence of the holiday using thin tissue paper, and hearts made of fall leaves.The look is finished off by using a tealight to light the mason jar from the inside. Creating a mason jar lighting fixture like this one is a great way to use a broken or unneeded wheel that would otherwise be thrown out. 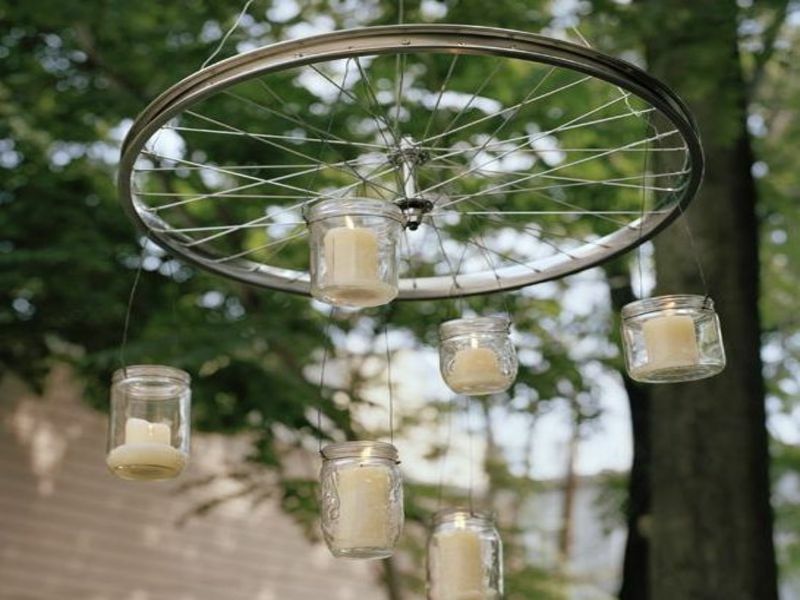 Large mason jars are filled with candles and then hung, suspended, from the rungs of the wheel. The whole fixture can then be hung securely from the roof of the porch, a large tree, or backyard shelter for a unique DIY lighting solution. If you like tiki torches, you’ll love this idea. It uses tiki torches and mason jars to complete a fun DIY mason jar project. 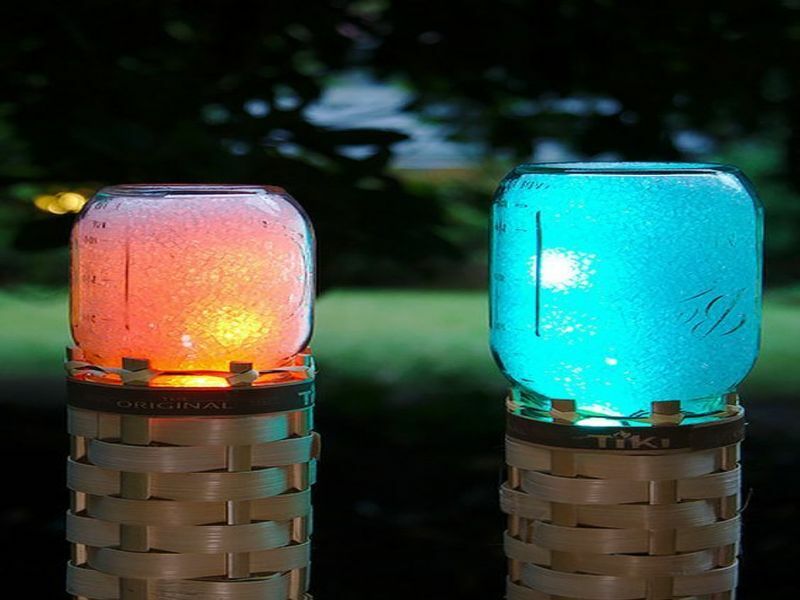 The mason jars, when filled with different color lights, shine brightly and give tiki torches a unique flare. This idea is great for when you want a mason jar lantern that can stand tall and doesn’t need to be hung. This easy to create mason jar light looks like something from a science fiction movie and captures our attention. The color gradient of green, yellow, and blue is seamless and appears to have swirling designs within it. When the jar has a candle or lights placed inside of it, the gradient glows. 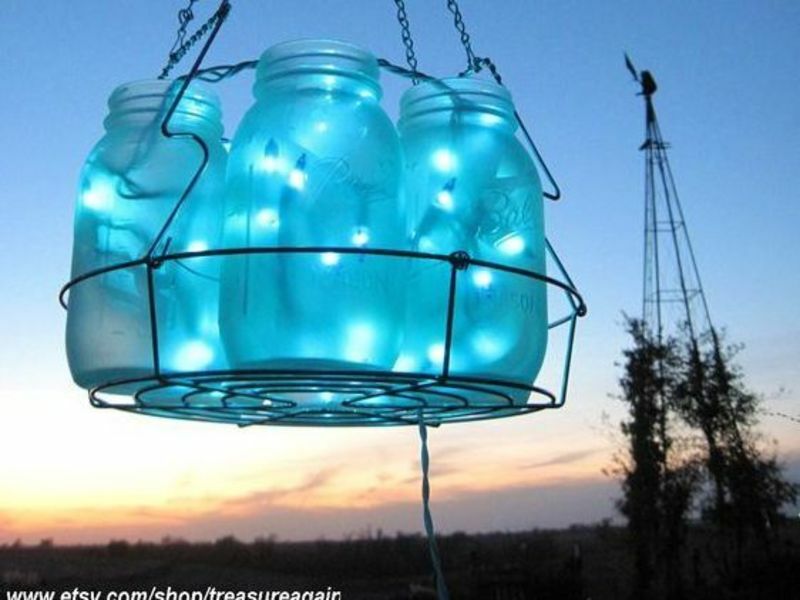 While this mason jar light project appears to be a bit time consuming, the finished result is worth the time. This design utilizes the see-through properties of glass pebbles. 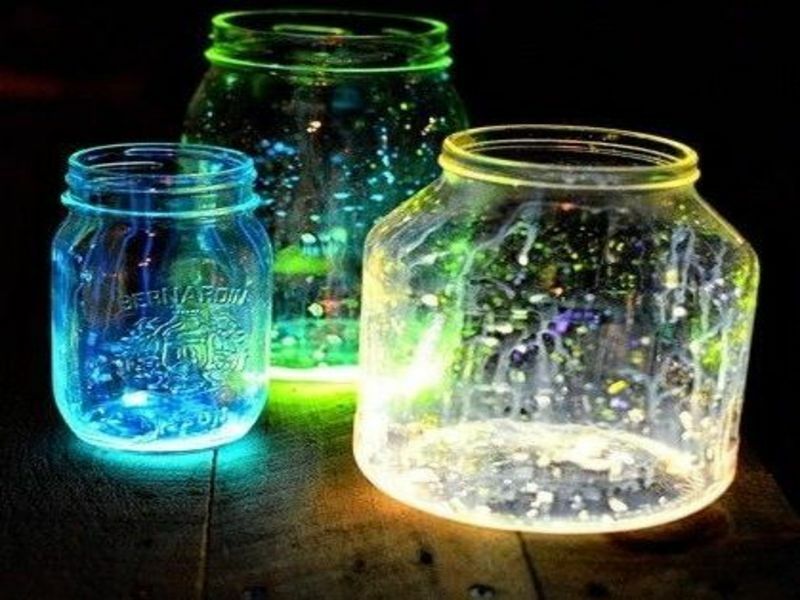 They are glued onto the mason jar, and then a candle is placed inside of the jar and allowed to shine through the pebbles, casting off a fun display of shadows. The jar is given an extra bit of elegance by the bow that is tied around the lip of the jar. 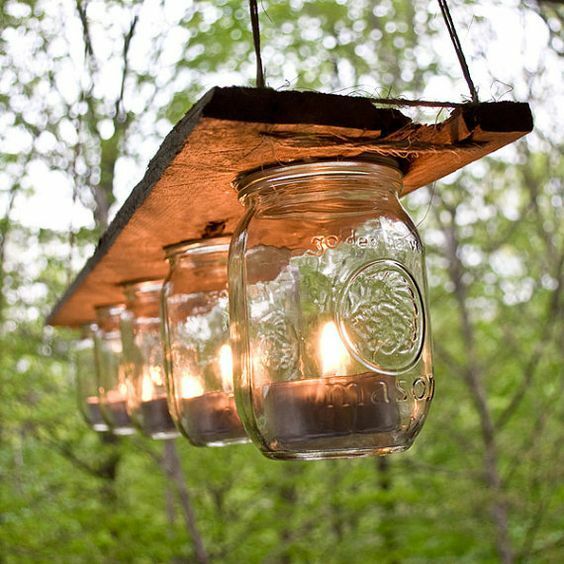 These cute mason jar lights are the perfect addition to any fall yard decor. They are basic and easy to make, but cute and easily personalized. Each jar is complete with a decorative ring of paper, a button and string combination, and a extra bow at the top. Wow your friends with this mason jar light idea next Halloween. With this idea, you can create light mummies of varying sizes and shapes. To take it a step further, you could even give each mummy its own unique facial expression! These lights don’t look like they have been created at home- they look like they were purchased at the store for a hefty price. In this design, the light bulbs of the lighting fixture have been replaced by mason jars that have light bulbs inside of them. 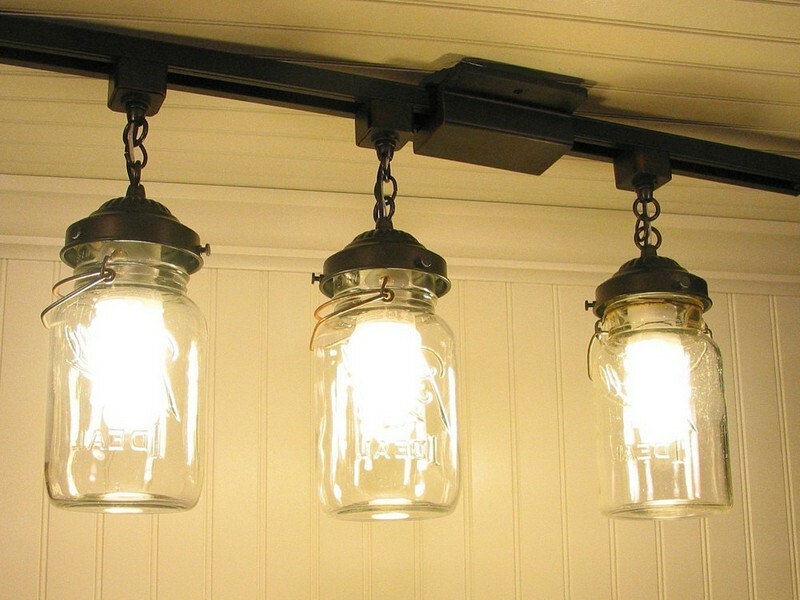 The idea is modern and utilizes the classic, no fluff, mason jar light style. 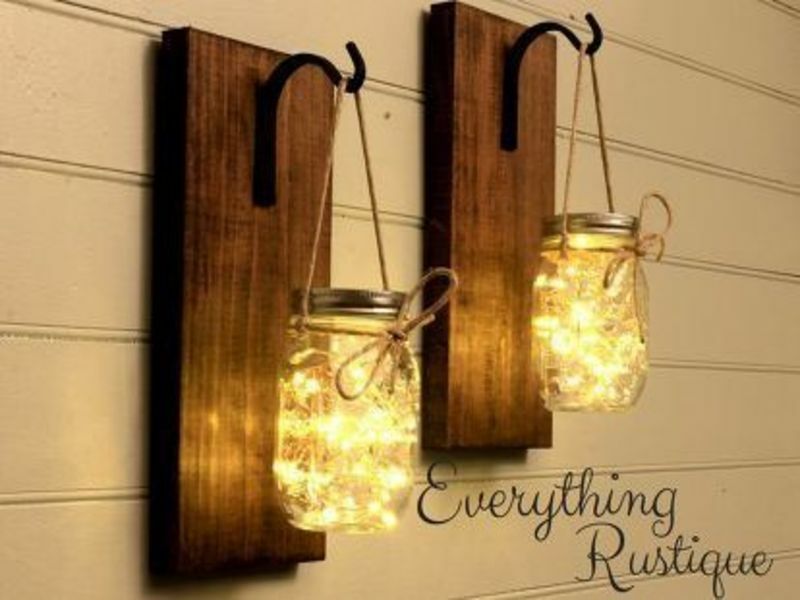 This mason jar light idea is easy to recreate and looks great when it’s done. 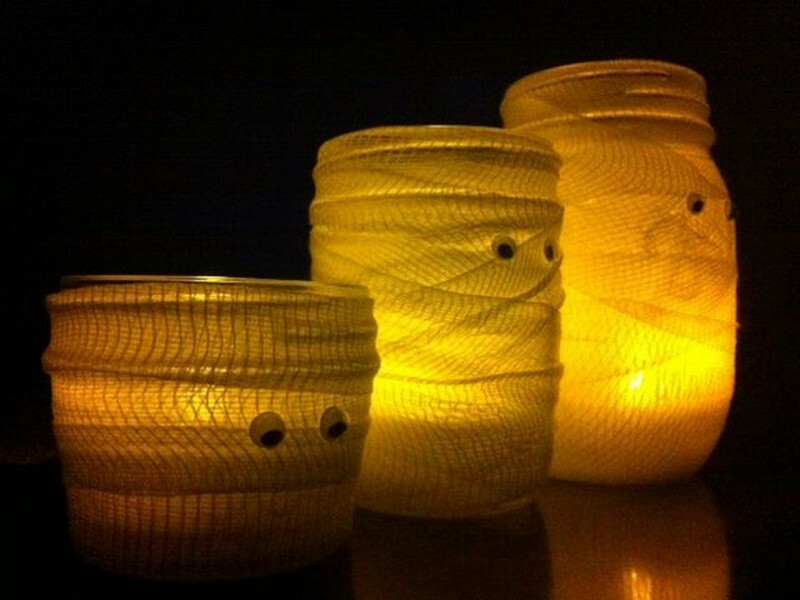 Each mason jar is filled with a cheesecloth-like material and a series of small lights. On the outside of the jar, the creator added a few black stars. The whole lantern is hung from wire hooks. For anyone who lives in America, this mason jar light idea is the perfect way to celebrate the country. 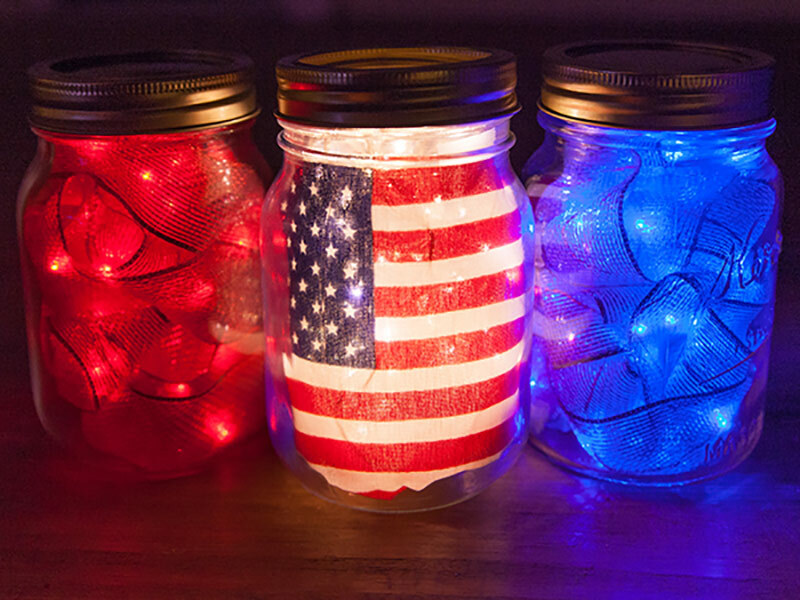 On the 4th of July, these mason jars can be recreated and displayed. The jars are stuffed with cheesecloth and fairy lights of blue, red, and white and the middle jar is stuffed with a miniature American flag that serves as the focal point of the mason jars.